"Oh oh, some mental training would make sense right about now!! ", I often thought during climbing when I remained stuck in one place, nervous and cramped. We all know that feeling, don't we? The only problem is that we mostly think about it during climbing and commit to it then but forget about it quickly in our everyday lives. Training the mind is something I used to underestimate for a long time. I was never able to get the right grip on it even though I had always been interested in it. I often left it at consuming information about mental training and that was it. Obviously, theory alone has not helped with my climbing. 🙂 "So what? Just do more climbing and it will straighten itself out," I thought to myself. 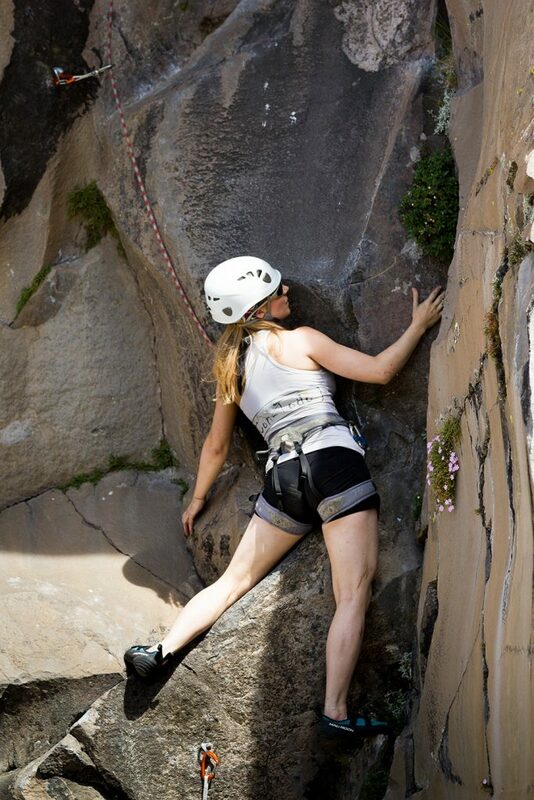 Climbing has definitely always helped me gain more self-confidence and react more intuitively. Nevertheless, I often encountered situations during my climbs that ruined the fun for me. That - despite several attempts - I simply did not dare to lead after the third hook at the top. The realistic mind movie that my arms are so tight right now that I can't even hold on to the large hook and will fall any minute. Stress in its many forms. I also remember that I believed in stressing myself out with the thought that I "had to" lead the route because other climbers did that as well. And how I got mad at the same time because I do not have to define myself through performance but do it anyway. Or this stupid thought that I - as a beginner - would delay others that have been climbing a long time already. And a pinch of sadness that I hold myself back during climbing because I am afraid that I will run out of strength. That I often left it the attempt and then look for excuses why it did not work out instead of giving it 100 percent and have faith in myself. I also found it regrettable that - even after I had already been climbing for a few years - I still indulged in negative comparisons such as: "Why the hell can she do that and I can't?" instead of "She is doing a great job. What can I learn from her?". Climbing in the Valle de los Cóndores, Chile. The walls are smooth with edges and cracks. Brrr. I was climbing there for the second time in six years and remembered how little I enjoyed it the first time around. A pity, as this place is beautiful. That’s why I chose the top rope this time. Luckily, these situations did not happen too often. I do, however, remember exactly how they influenced me to the point that I no longer perceived the beautiful landscape in those moments. Why can't I climb like the others? I used to envy those climbers that were cool and collected and did not show any sign of nervousness when approaching a climb. 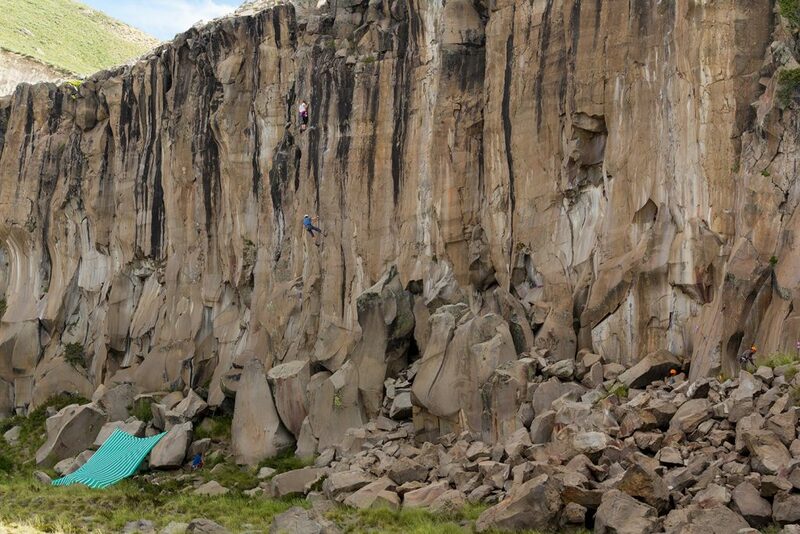 Bouldering in Punitaqui, a beautiful region in the north of Chile. I always admired the serenity and concentration of our friend Walo. To only use friction while reaching for a tiny edge… phew! "How I would love to climb like that," I often thought. "Why can't I climb like that?" A useless wish and question. Obviously, you can change and imitate someone else's climbing style. The basis is to start with yourself and to accept the current situation. Otherwise, the situation will never change from the subjunctive to reality. „Do I really look that worried?“ I asked when I saw this picture. Okay, maybe that’s what I look like when I am concentrated… but I do look tense. 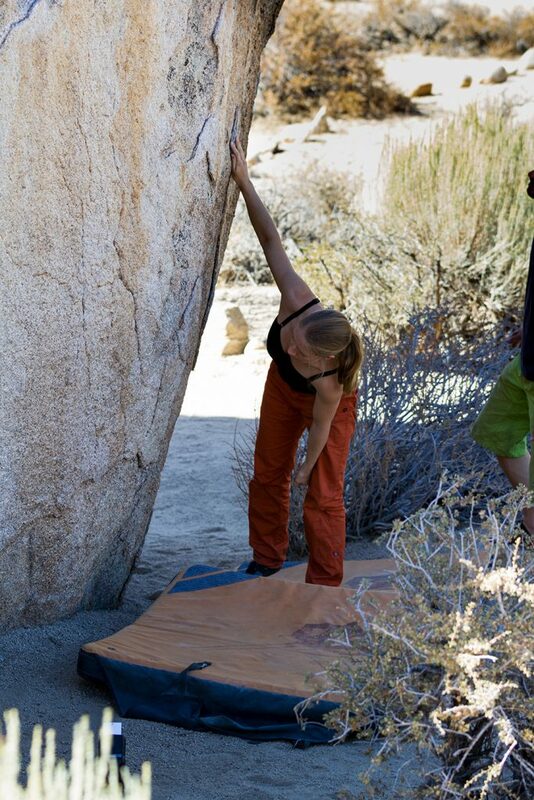 I remember how challenging the first boulders of the Buttermilks in Bishop with their sharp grains and tiny holes were. In this picture, Roman and I go over the moves. How can I find the positive in this? When I first asked myself that question, I could not think of anything at first. Do you know the feeling that sometimes you cannot clearly think of the right answer but that you conceive of an option that feels right? That's what finally happened to me. So far I found two aspects that make these bleak moments appear in a different light. #1 Even negative feelings make you feel alive. Had I never gone through these difficult moments during my climbs, climbing would probably be a great sport for me that is great fun and interesting but not more than that. A wonderful opportunity to conquer oneself, thereby becoming stronger. An opportunity to once again visualize one's own strength - we often forget how strong we are deep down inside. To be completely in the moment and to fully experience the intensity rather than to be in the before or after. Don't try to do it half-heartily. DO IT. „Where can I put my feet?“ I noticed that preparation helps me with challenging boulder problems and ensures that my moves are more coordinated and targeted. If I wouldn’t have any attitude problems I probably wouldn’t even take the time for it. #2 I can practice it. Training never stops. I used to give up very quickly if something did not work out right away, which was one of my greatest challenges during climbing as well. Quitting too soon instead of persevering. I know it sounds slightly pathetic but it really feels like that: I now view these frustrating moments from my past as an opportunity I was presented with. An opportunity for a different perspective. I found that I do not have to perfect it right away. Even though talent helps, what really matters is one thing: Training. To practice something time and again. That learning never stops if you want to stay alive. Why does training the mind for climbing receive less attention than strength training and technique? Good question, especially because we all know how important training the mind is. Everybody knows Wolfgang Güllich's quote that the brain is the most important muscle during climbing. Maybe because training the mind is less obvious than strength and technique training, much like strength and technique training would represent the top part of the iceberg that's easily visible whereas mental training represents the bottom part of the iceberg. Another reason, however, is certainly the fact that it is more multilayered and complex than physical training. Still at the Buttermilks in Bishop. Even though I am in a bit of a barn door situation in this picture, I was happy to finally have a few big holds! 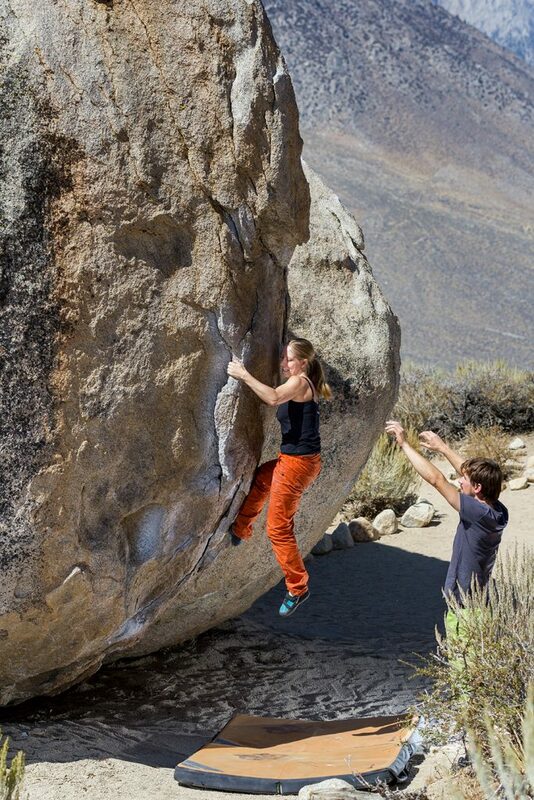 The boulder does not look that difficult, however the top part took a bit of mental effort. I made it at the third try and was very happy that I persisted. It all started when I once again wanted to practice more yoga in the morning. I don't know how you feel in the morning but I am stiff like a piece of wood right after I first get up. The Vinyasa yoga videos with very fast movements - which I used to love for a while - soon no longer worked very well. I started noticing that my left shoulder became more and more sensitive because of the many dog positions early in the morning. That was reason enough for me to stop the quick flows. Especially in the morning. I then mainly practiced strengthening positions in the morning and paid closer attention to stability. And so I slowly but surely got back to practicing yoga the way I started on my yoga path: With Kundalini yoga that my friend and yoga teacher Nina called "not exactly suitable for the masses". 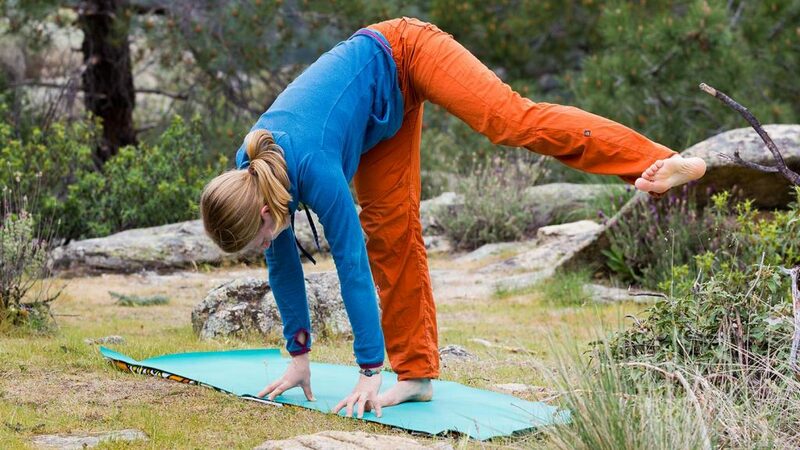 An example of a yoga pose that is unusual in “regular” yoga: shift your weight from one foot the other and raise the other leg in a controlled (that’s the challenge) way. It’s easy at the beginning but gets very exhausting after a while. What did work for me, however, is that the degree of difficulty ranges between very easy up to very unpleasant, that you work a lot on your breathing and especially to stick with it. Does training the mind have to include yoga? In my opinion, there is not just that one solution or that one path. Training the mind is a major topic and I can imagine that there are many practical solution approaches that really work. What makes yoga such a valuable mental training tool for me? To practice something unpleasant step by step in another environment and use breathing more effectively at the same time. To use the connection between body and brain with strengthening and opening positions. To practice the ability to concentrate, which is something we often underestimate in today's lifestyle. The beauty of yoga for training the mind is that uncomfortable positions can be tackled in tiny doses and adapted to your needs. That’s important for me as otherwise I wouldn’t even get started. Affirmations are too brain-related for me and may work for me - at times - while climbing but not as the basis for training the mind. For me, it is important to start on the physical level and to create the trust necessary for me to stick with it without causing me too much stress. These successes, small as they may be, establish themselves in the subconscious over time, which brings me back to the iceberg: The subconscious is so much stronger than the pure rational level! I could go on here forever but let me make my point here. If you are as fascinated by this subject as I am do not miss this new three-part workshop video series! 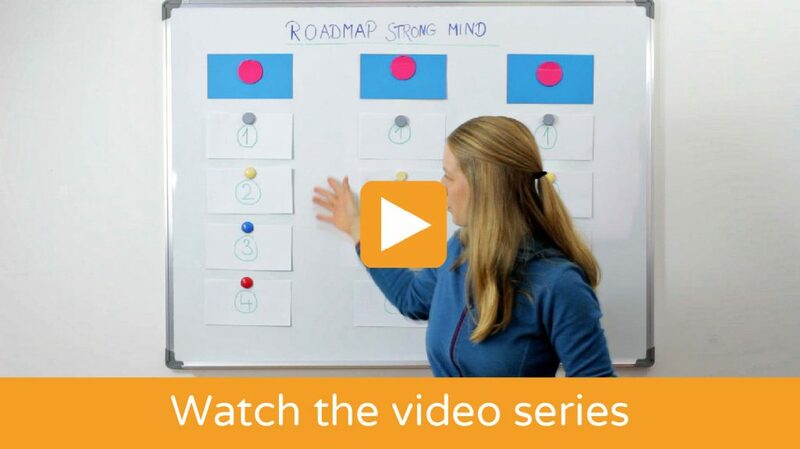 In it, I am going to explain how to turn your mental training into a manageable process, what three important ingredients to watch out for in order for it to work and - finally - how to train your mind together with us. Aside from the iceberg model I can think of another analogy related to strength and technique training. They resemble software and nonslip hardware. As long as both are in harmony, it’s fun. If you frequently suffer from mind movies as well, don’t worry. They can be managed. If the emotions are strong, ask yourself this question: “What could be positive about it”. Or if you would like to keep going: “What could the reward be?”. Training the mind has become incredibly important for me. It not only enabled me to keep at it during climbing, but it also helps me to strengthen my stamina instead of always looking for the easy way out. In my opinion, yoga works this well, as it addresses the physical level and trains uncomfortable positions in small doses until they become normal. After this long story, I am interested in your opinion. Do you think training the mind is important? Do you implement it in your routine? Thanks for sharing that aspect about the breath, I think it’s a crucial point. I agree it’s so easy to forget about your breath when you’re in a pose. That, by the way, often happens to participants with more yoga experience, too. The more you practice paying more attention to your breath and repeat the same sequence or class, the more you’re able to increase the quality of the pose by using your breath. 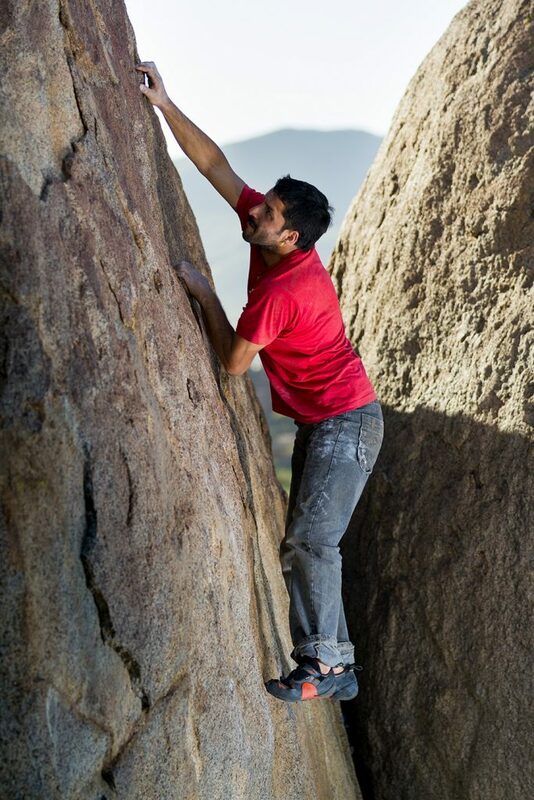 Now I think it’s more challenging to use my breath efficiently when climbing! 🙂 Depending on the route, I find myself holding the breath and remind myself of coming back to deeper breaths when I feel tired.